I found Tannis‘ WoGE #289 more or less by accident, just having a quick look and suddenly realizing that I am in the right area. It was more difficult to find some literature about the Bomapau and Kiriwina Islands. A great area, very high seismicity and a complex tectonic situation. Seems to be a fantastic destination for holidays as well, all those beautiful atolls must be great for divers. I set up a new one now, and as I think it’s rather easy I do invoke the Schott rule (sorry, Ron and Felix): “Previous winners must wait at least one hour for each win that they have before posting a solution – other comments are okay”. Posting time was 07:43 UTC. The general rules are simple: Find the location, provide coordinates and describe the geological feature in the comment. A list of all former WoGEs can be found at Felix’ blog. 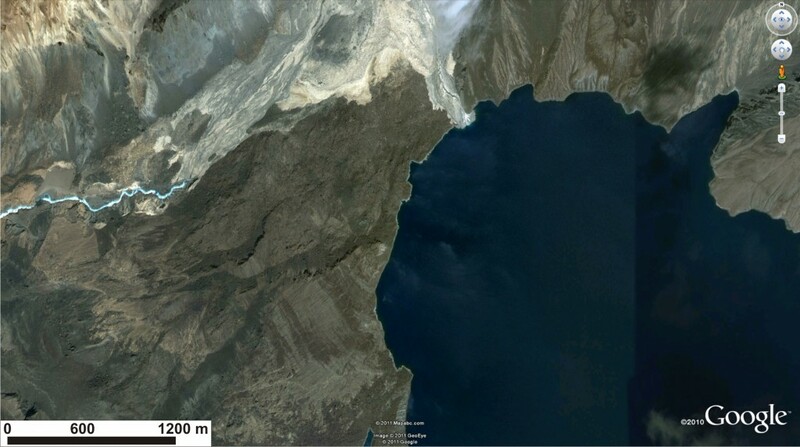 It’s Sarez Lake and the Usoi Landslide Dam in Tajikistan. The lake is impounded by the world’s highest landslide dam (550 m) formed by an earthquake in 1911. Coordinates 38.278 N 72.611 E.
I use this as a teaching example in my Fluvial Processes class, so I thought it looked familiar. Though I usually show the satellite image of the whole lake (http://eol.jsc.nasa.gov/EarthObservatory/Lake_Sarez,_Tajikistan.htm) – I like the way you’ve done it because you can really see the dam. Anne, you are right. It’s a great example, I would really like to see this huge slide with my own eyes. There is still a lot of concern if the dam would survive the next strong earthquake, which will definitely happen. WoGE # 291 is yours! The new WoGE is up now: http://all-geo.org/highlyallochthonous/2011/06/where-on-google-earth-291/ Get your feet wet! Christoph: no need to say sorry because of the Schott rule. On the last challenges the “oldtimers” did beat me uneducated newcomer that bad, that I had to disappear on holiday. So everyone relax one more week before I am going to be back on hunting.